On the first of every month, someone is awarded the prodigious title of Whisk(e)y Warrior. A question and answer interview is conducted with the valiant warrior, and then distributed to the world. What is a Whisk(e)y Warrior? Find out more by clicking here. Justin: So, I’m from Greenville South Carolina. I’ve lived in this area pretty much my whole life. Just had my first son this year so that’s exciting. I’m a production supervisor for a tier 1 automotive company. Zac: What was your first introduction to whiskey? Justin: I guess when I first turned twenty-one and I started being able to go out places. The beer scene wasn’t really big then. So it was like you go get a cocktail so you kind of look cool, you know. I don’t know, mixing drinks a lot of times just wasn’t, I mean it’s alright, but I like the flavor without the coke or whatever you mix with it. Makers Mark, I think, was the first time I drank something and I was like wow I think I can drink this without anything and enjoy it. So, I drank Makers Mark and Jack Daniels and stuff like that for a little while. Zac: What pushed you deeper into the bourbon world? Justin: I bought a new house, me and my wife, and so there was a downstairs room that had this real elaborate ceiling and wood floors and I was like this would be an awesome bar room. At the time I thought you know I’ll just throw a couple of shelves in here and a couple little seats and a couple bottles of you know Makers Mark, Jim Beam, Jack Daniels, your staples. My brother-in-law bought me a Bookers, a Crown XR, and a couple other things that just were for me out of my realm. But we started trying those and it was like wow these are really good. And then after that it was a downhill spiral from there. Then it was me and him kind of chasing stuff. Zac: Any funny bourbon hunting stories? Justin: Man, I remember I got GOT so bad. I found Eagle Rare on the shelf and I was so excited and I didn’t know any better so I paid $80 for it. Zac: Oh you did get got! Justin: Yeah! But I was so excited that it didn’t matter. You know what I mean, only later on did I find out. I was like, “Oh they saw me comin’.” So bad. But it was a newbie mistake and I think a lot of people make it. Zac: You know to be fair, Eagle Rare is good enough to be worth $80. Justin: And it opened up my eyes to everything else. I mean from there it was Blanton's and then I think Noah’s Mill. After that then I really started digging into the different things. It’s been awesome. Zac: What prompted you to take a personal passion for whiskey and to start connecting with others? Justin: I think once I got Instagram that’s when it really, everything changed. I started talking to other people and I was like, “Hey what is this and what is that?” And people are sharing things. The generosity that people showed me and they were so accepting of my ignorance. Zac: Now that you’re on the other side of being new, what do you enjoy about the Instagram whiskey community? Justin: What I really enjoy about the whole Instagram thing and new people to it is, I’m like hey if you live down the street or next door to me and you’ve never tried something, I’d say hey man come on over and let’s have a glass and try it. And we can sit there and talk. But if you’re in [another part of the country] I send you something and if we can’t get on the phone or something then we can just shoot text back and forth and you pour a sample of that and we can talk about it. Zac: Speaking of pouring whiskey, what’s your top 3 best value for the money whiskeys? Justin: So I definitely think the Bullet Rye is really underrated. Eagle Rare, it’s always been a fan favorite but I really think it’s getting to the point now where people know. Eagle Rare is a top one. Knob Creek, a lot of old timers drink it but, the store picks are really bringing it back. Any store pick Knob Creek I can get my hands on I’m going to grab it because their retail is like $50. Justin: It’s probably something that’s been said many a times before but don’t follow the hype. Follow your instincts, learn your own profile, taste what you think you’re gonna like. Don’t look at the label look in the bottle. Zac: Do you have any favorite whiskey and food pairings? Justin: So, I’m pretty odd. I guess I’m a Southern guy. Like I can never go wrong with one of two things. I’m either having whiskey and boiled peanuts or whiskey and peanut butter patty Girl Scout cookies. Zac: What are some things you’re appreciative of in the whiskey community? Justin: I think just meeting the people that I’ve met. Especially like I said on Instagram or people that I’ve met online and then actually met in person. I went to Kentucky last year for a Bourbon Drinkers United, a little small group they got started by a friend of mine in Kentucky, and he’s like I’m gonna try to get everybody out here. We had people come from California, Missouri, we had people come from everywhere. And you look at these people and if I saw you walking anywhere else, I may have never talked to you. But it’s just so nice that you get to meet people and actually get to know people more than the bourbon. Like you’re all linked by this one thing but you actually gain friendships that are at the end more important than anything. Zac: Where can people connect with you? Justin: Definitely my Instagram page, @backyard_bourbon. Zac: Justin it’s been such a pleasure making your acquaintance. Thank you for taking the time to speak with me. I wish you many fulfilling friendships over happy glasses of bourbon. 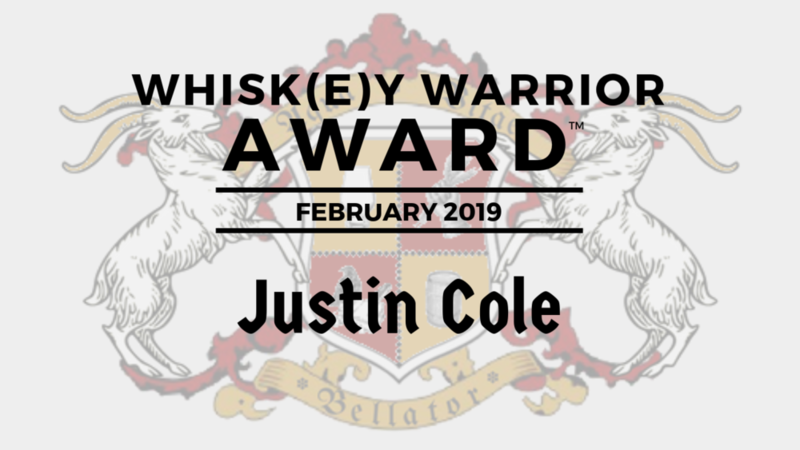 Remember to nominate your favorite Whisk(e)y Warriors by clicking here. The next award will be released March 1st. We’ll see you then.